Processing applications for help with fees used to be a time-consuming and complex task. Adding guidance to the new digital service has reduced processing time and provided support when it's needed. 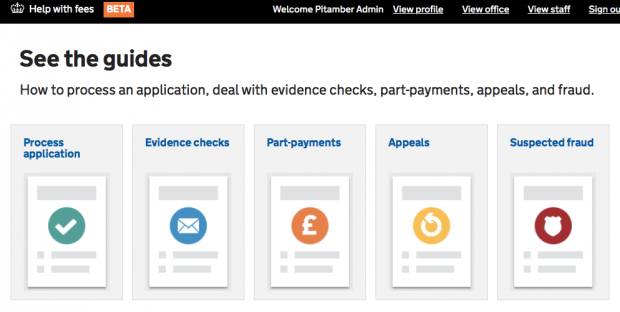 Staff in 200 courts and tribunals across the UK are now using a digital service to process applications for financial help with court and tribunal fees. And yet, processing an application remains a complex process. Our user research showed that staff needed support – particularly in untangling policy rules around eligibility. 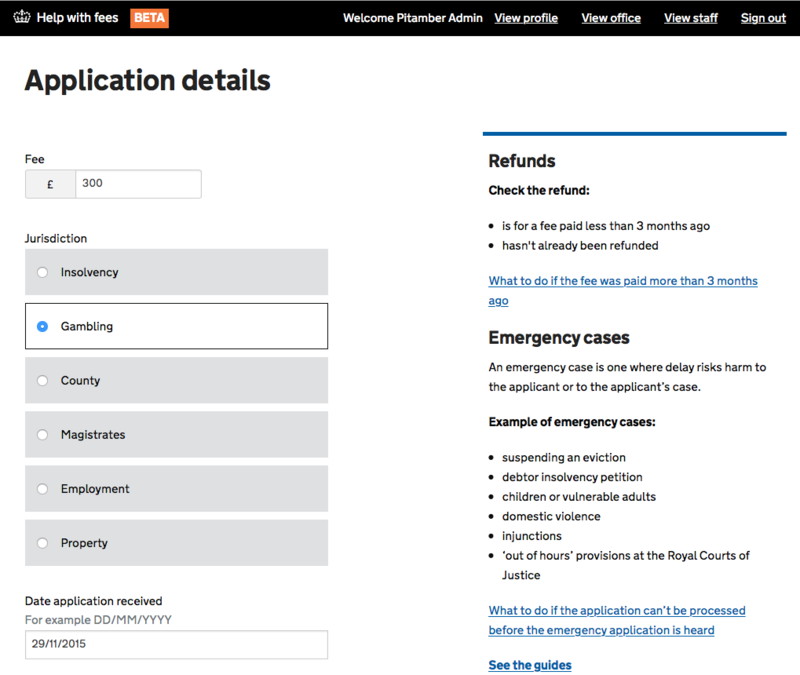 The help with fees application processing service was designed and built in line with the GOV.UK design principles. These help us make services that are so simple that little contextual guidance is needed. If you have to say ‘click below to do xyz’ then it’s usually a sign the design and content aren’t working. What makes this service different is the amount of specialist knowledge that court staff either need to know or have to refer to when processing applications. For example, can a 17-year-old living at home be classed as a 'financially dependent child' when assessing income? Or does an eviction case count as an ‘emergency case’ (one that can be processed more quickly)? Should a pension payment be considered as ‘income’? Staff used to get this policy info in large numbers of Word documents. The former help with fees staff guide ran to 53 pages with 15 appendices. Staff often found it easier to print out the guide but there was always the danger that they’d be referring to out of date information. Even small changes in policy meant the guide needed to be reprinted. We wanted to make it possible for staff to process applications on screen without having to refer to a separate paper document at all. ‘Frequently asked questions’ are a well-recognised web content format, but they often don’t make it easy for users to find the answers they need. See Sarah Richards' post on FAQs: why we don’t have them. To make it easy for staff to process applications they need to be able to get answers without having to click away or interrupt the processing journey. As a result we produced contextual guidance on pages where user research showed that staff needed support. This includes links to more comprehensive guidance for more in-depth information. As the guidance is all in one place it's easy to update. So whenever a change in policy means a change in process, staff will get news about it straight away. I think that this service so far is extremely good and the guidance at the moment seems to be extremely clear and easy to follow. I can see it saving staff time and making their lives easier when processing the EX160A forms. It is simple to use. I love the site. I have only just been set up with the system but it looks fantastic – so easy to use and the guidance is great! Have you had any experience of using guidance to support users with detailed policy information?